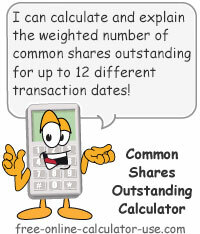 Enter the number of beginning shares outstanding and then select the beginning date in the row directly below this one. Select the beginning month, day, and year. Note that this date selection will need to come before all other dates selected in the remainder of the calculator. In the row directly below this line, select the ending date of the period you are calculating outstanding shares for. Note that all selected dates must be earlier than this date. Use this section to enter the stock transactions that occurred between the beginning and ending dates selected above. Note that the calculator will attempt to sort the transactions in chronological order (from earliest to latest), but it would be best if you entered them in that order. To add a transaction, select the date of the transaction (must be unique from all other transaction dates), select Increase or Decrease, and enter the number of shares transacted. When you're satisfied with the selections and entries, tap the Add ... button. To edit a transaction, click its numbered Edit button to load the transaction into the form. When you're done making changes, tap the Save ... button. To delete a transaction, click its numbered Edit button to load the transaction into the form. Then click the Del... button. Important! In order to save your entries for your next visit, you will need to create (or save an existing) data record under the Data tab before closing or leaving this page. Select the the date of the transaction. Note that the date must fall within the selected beginning and ending dates, and it must be different from any and all other transaction dates. If two or more stock transactions occurred on the same date, please combine them into a single entry. Select whether the transaction resulted in an increase or a decrease in the total common shares outstanding. Enter the number of shares associated to the transaction. This is the calculated number of days from the beginning date to the ending date. This is the number of shares outstanding after the beginning and all entered stock transactions have been accounted for. This is the weighted average of the shares outstanding from the beginning date to the ending date. This free online Stock Shares Outstanding Calculator will calculate the weighted average for a company that changes its number of outstanding shares during the course of the time period you are interested in. Unlike most textbooks that simply limit their examples to number of months, this calculator measures durations in number of days. Plus, after calculating the weighted average the calculator will generate a line-by-line summary of each transaction. Note that the results of this calculator are most commonly used for calculating the Earnings Per Share (EPS). Enter the number of beginning shares outstanding and select the starting date. Enter each stock transaction that occurred between the beginning and ending dates selected at the top of the calculator -- in chronological order. Note that you can edit or delete each entered transaction by selecting it from the list and clicking either the "Save Changes" or "Delete" button. Click the "Calculate Weighted Average" button. This will display the total days, ending shares, and weighted average. The results will also include a period-by-period chart showing how the weighted average was computed. What weighted average is, how to calculate it, and how it compares to simple average. Weighted average is a calculation used to give more weight to more influential values within a data set, and lower weight to values with less influence. As it relates to shares of outstanding stock, the weighted average calculation gives greater weight to larger numbers of outstanding shares and to longer durations, and gives less weight to smaller number of shares and to shorter durations. To illustrate the difference between simple average and weighted average, suppose a company has 10,000 shares outstanding at the beginning of the year and 20,000 shares outstanding at the end of the year. Using a simple average formula, the average number of shares outstanding would be 15,000 (30,000 ÷ 2 = 15,000). However, if the year-end share increase was due to a stock split that occurred on December 15th of the year, the 15,000 simple average result would not accurately reflect the day-to-day average for the entire year. The following results from the calculator on this page shows how the weighted average calculation more accurately reflects the day-to-day average of outstanding shares. See how weighted average more accurately reflects the day-to-day outstanding shares during the year? Count the total number of days from the beginning date to the ending date. If the total duration is a full calendar year (January 1 - December 31), then the total number of days would be 365 (or 366 for leap years). For each period containing a different number of outstanding shares, count the number of days in the period (column C in example) and divide that result by the total number of days (results in column D expressed as percentages). For each period, multiply the decimal result arrived at in step #2 by the number of shares outstanding during the applicable timeframe (results in column E above). Add up all of the results arrived at in step #3 (sum of column E in example). That sum is then equal to the weighted average number of outstanding shares. Note that if you find yourself trying to calculate weighted average manually, it will be easier -- though less accurate -- to work with durations stated in months. In that case you would divide the number of months in each change in outstanding shares by the total months in order to arrive at the percentages in column D above.